Having worked in the field of future decision making and strategy for many years our team have increasingly recognised the shortcomings of the traditional approach to scenario planning and simulation. We found that our clients were increasingly making inaccurate market assumptions, not leveraging internal data, ignoring cross-functional knowledge and interaction, and making decisions that were not as well informed as they should have been. We realised our clients were not responding adequately to the growing complexity and rapid change many markets were and are going through. Consequently, we realised that assumptions that were inadequately thought through were having a detrimental impact on the validity of the thinking, conclusions, and hence plans, derived from scenario planning and simulation. In addition, we also became aware that the simulation process itself required refining for the modern world. Clients, often because they had experienced this elsewhere, considered competitor strategy as deriving how they could be better at doing the same things as their competitors, for the same types of doctors, patients and other stakeholders. We knew that this had to change because successful competitor strategy is based upon unique views of patients, doctors and the promise of treatment. We recognised our role, as the facilitator of the process and as experts in the field, in driving client thinking towards unique ways of defining segments, position and new ways of executing their strategy. This is not easy, though we viewed it as essential to providing real value and differentiation to our clients. Whilst we specialise in healthcare consulting across pharmaceutical, biotech and device industries we believe the approach we propose is applicable to most, if not all, industries. Every person joining a marketing consultancy or going on a training course about competitive strategy rapidly hears about The Art of War by Sun Tzu. It is often described as the seminal work on competition and competitive planning. Indeed, it is a good read; it’s short, full of pithy phrases and communicates some fundamental and important concepts very well. Sun Tzu was a military man over 2,000 years ago in ancient China. The book introduces critical competitive concepts such as thinking like your enemy, playing to your strengths and your competitor’s weaknesses, and the value of planning. The concept of simulation is not explicitly discussed in the book, though it is an obvious consequence of the thinking therein and Sun Tzu is often mentioned by people hosting competitor simulation workshops. The essence of The Art of War is that thinking about the future when done in a structured way, or strategic planning as we may call it, can increase your chances of success. The Art of War is without question a great book. However, it only goes so far, and we need to think well beyond the parameters of the book to find useful approaches to simulation that serve our modern, complex and uncertain markets. Sun Tzu tends to consider a static situation; we need to consider how rapidly evolving markets will change over time. Sun Tzu considers a 1:1 adversarial situation (hence the chess imagery that we will dispense with hereafter or, for that matter, the concept of soldiers pointing guns at each other! ); we need to consider multiple stakeholders with differing and sometimes competing goals. If the chess analogy were to be realistically used today it would probably have a minimum of four players and be played in three dimensions. To understand how thinking about the future can help us develop a strategy for the future we recommend “The Art of the Long View” by Peter Schwartz as being a more useful read about today’s uncertain and complex markets. Schwartz and colleagues’ work built upon the work of the military planners in WW2 where the US Air Force used scenario planning to consider what their enemy might do and to prepare alternative plans. Their work forms the basis of thinking about scenario planning in modern business. For clarity, we want to deal with the definitions of “Simulation” and “Scenario planning” here to avoid any confusion. Both are clearly about understanding what the future means to your business and assets. Both require assumptions about the future. 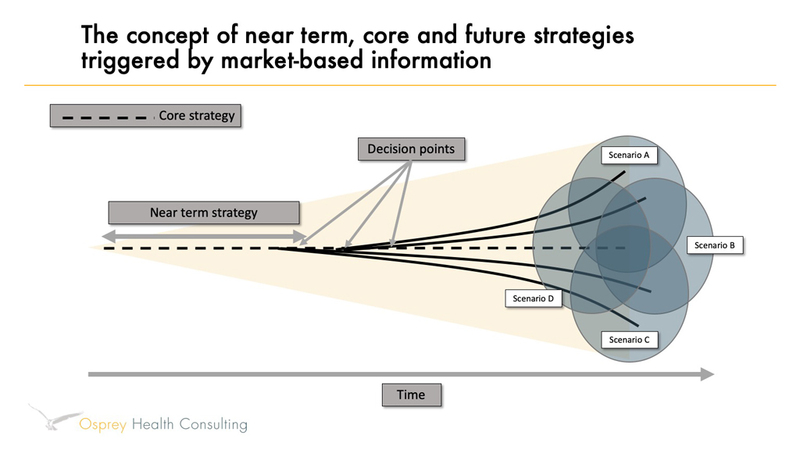 We argue that in complex and uncertain markets (such as those with multiple stakeholders, multiple players, different types of products, varied pricing platforms and often where technology is reshaping markets) you must consider the future market scenarios first. Without this you can’t simulate anything. Scenarios are different perceptions of the future that may be based upon flexing assumptions and allow you to perceive different future worlds. They define what is “Core” about a range of futures and critical things that “May” happen in only one or more of the likely scenarios. Scenarios require broad and deep thinking about how markets may be influenced and changed. The “Core” and “What if…” assumptions developed provide a framework for simulation, the world that you imagine your business and assets and those of your competitors will operate in. Historically, many organisations have tended to consider that markets will, generally, be an extrapolation of existing trends and make simple assumptions such as launch dates or pricing, and that new treatments will enter an existing market paradigm. This is often not valid (or at least not sufficient) in today’s fast moving and complex markets. Simulation is the process of “Playing out” how stakeholders and other companies are likely to behave in the future world re-perceived through scenario planning. A detailed understanding of what drives competitor companies and stakeholders is required and immersion in their style of thinking is essential. With access to detailed information a great deal of this can be developed and evidence-based decisions about future behaviour can be developed. Today, simulation often needs to become more about the interaction of the individual players or stakeholders than it is about what a specific player might do, and with this increase in variables more data and understanding is required to maintain margins of error. In brief, scenario planning supports us in developing a framework to aid our decision making about the future. Simulation describes how the players are likely to operate within this framework. Perhaps one of the greatest changes in the strategic thinking process over the last 50 years has been the increase in the amount of information available. We have a lot of it about markets, about competitors and stakeholders and about likely future developments in markets and science. This allows us to build models based on data, not conjecture, and to consider complex “What if…” statements to build scenarios of the future. It also allows us to “Test” our thinking over time by monitoring key market attributes. This whitepaper covers a modern approach to critically assessing likely futures, their impact on your market(s) and how you can best position your assets and business to respond to the future. 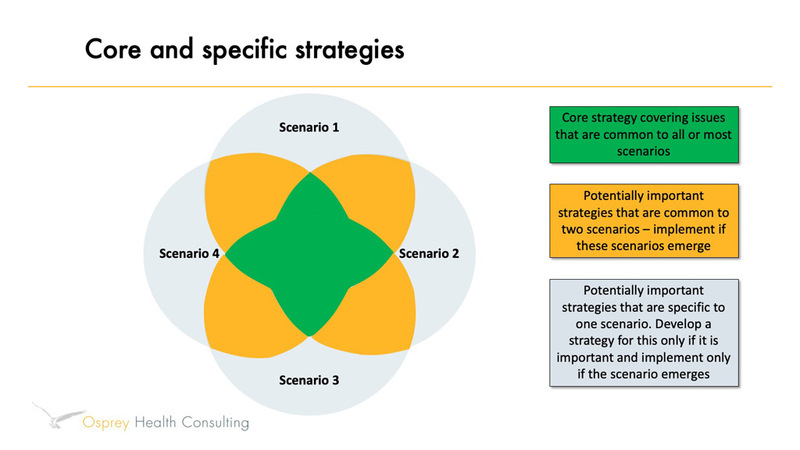 The goals of scenario planning are to reduce the likely elements of a future landscape, such as a market or a government regulatory approach, so that your organisation can make decisions about where and where not to place resources, how to handle competition and which products or product attributes to develop. Scenario planning is not about predicting the future; it is about refining the likely variety of futures so that they can be considered in a systematic way, with unlikely futures being discarded and less likely though important elements being considered. Exhibit one provides a schematic view of the goals of scenario planning. The systematic gathering of data that describes the existing state of the landscape and provides insight into existing and future trends that will impact the market, bearing in mind that many trends may be external to the landscape such as government policy, consumer trends and climate change. In addition, through this process gaps in information will be identified and resources used to either fill the gap or hypothesise what the data is likely to be. The detailed consideration of what drives and does not drive the landscape. It is often the case that an organisation considers that there are a large number, often in the range of 5-8, key drivers of a landscape. However, through skilled and evidence-based analysis the interrelation of drivers can often be determined and the number of drivers reduced to 2-3. This requires a detailed understanding of the landscape and its likely evolution, and an open-minded approach to thinking about the future in a non-extrapolated way. Extreme scenarios should be considered, often not for their likelihood but for what they tell you about existing and new trends. The creation of likely and imaginative scenarios that cover the critical elements future, as described in Exhibit One. The important concept here is that the organisation does not assume that any one scenario will actually happen. Each scenario will add some element of thinking to the building of a robust future strategy. Indeed, the value of this approach to the organisation is that it does not have to describe one future. All staff involved in the process must grasp this concept as it stimulates more accurate and comprehensive scenario development. A focus on what it means to the organisation. While it is an obvious truth that organisations embark on this process to improve the prospects for their business it is surprisingly easy to lose sight of this goal. Scenarios are a means to an end, not the end in itself. The value of scenarios is that they provide a framework for thinking. They are inevitably flawed, though are likely to be more comprehensive and less flawed than non-structured views of the future and the flaws will become evident. The value of scenarios is in the framework they create for our thinking about the future. A focus on measuring the evolution of the landscape. Once we accept the concept that scenarios are not perfect it is important to focus on how we can measure how the future is unfolding and how it differs from our scenario visions. Many differences will be irrelevant and unimportant. However, there may be critical data points to watch for that will indicate how a landscape will evolve. Exhibit Two illustrates this concept and the importance of monitoring how landscapes are evolving. While the exhibit illustrates the different directions in which the future may evolve it should not be assumed that it will evolve in the direction of any particular scenario. Having described the likely core future, an organisation can develop a strategy to position the business and its assets more competitively. This requires an understanding of how competitors and stakeholders behave driven by their past behaviour and an understanding of how they view the fundamental forces at play. 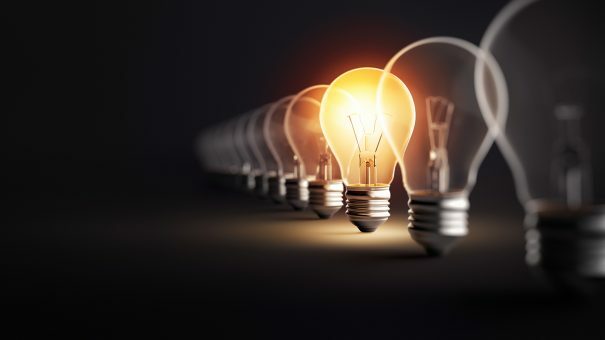 The organisation may also want to consider the impact of critical “What if” thinking – the yellow elements of Exhibit One – if the impact of the “What if” is likely to be either too positive or negative to ignore. To avoid an overly cumbersome process only a small number of “What if” elements should be considered and an internal process of prioritisation is often required. A detailed understanding of competitor and stakeholder behaviour. This requires both data gathering and the development of hypotheses about strategic goals that explain tactical implementation. The better this is done the more accurate a simulation will be. An approach that involves the whole organisation in thinking about the future and strategies. This is not a process for commercial or marketing departments alone. Insight is required from across the organisation, including internal functions such as production and R and D and perhaps from suppliers. A thoughtful and structured approach to simulation. The concept of a one day “War game” may be appropriate. However, so may a process that evolves over a few weeks with competitor plays or policy changes being responded to by “Teams” acting as competitors or stakeholders and a central group (often the consulting company) describing how the market evolves overall. Whatever the process decided upon it must address the particular goals of the organisation. A focus on what it means to the organisation. As with scenario planning there must be a focus on how the organisation should respond to the evolving activities of competitors and stakeholders. Therefore, the value of simulation is in the comprehensive and detailed strategic and tactical output for the organisation. A desire for insight and innovation. Using the process to define how an organisation can be better than a competitor at a particular tactical execution may have value. However, in our experience the process adds enormous value if it is used to derive unique approaches, unique positions and unique descriptions such as of customers or stakeholders. This requires a willingness to challenge thinking, reduce it to fundamentals and to allow individuals involved to express new ideas. This often requires the use of techniques such as The Six Thinking Hats developed by Edward de Bono to help organisations suspend judgement and allow innovative thinking to flourish. A commitment to communicate the output. The true value of the process is in the impact it has on the strategic direction and development of the organisation and its assets. This must be clearly communicated to ensure the organisation is aligned with the outputs of the process. A critical component, common to scenario planning and simulation, is the need for commitment and time. Neither part of the process can be done quickly and a reasonable assessment of the time and resource commitments required should be made at the outset of the programme. Scenario planning may take a number of months and the detailed preparation, delivery and review of simulation a similar amount of time too. Resources often need to be put into information gathering and the addressing of gaps, as well as providing a lead person or team within the organisation to champion and drive the process. It’s clear that scenario planning and simulation are time consuming undertakings. Also evident is the concept that the process does not predict the future, it merely defines what is most likely and important. If one includes the importance of the process to the allocation of resources and decision making in the business it becomes evident that it is important to assess how a landscape is evolving over time and how this relates to the decisions and resource allocations made. A number of key parameters can and should be identified that will indicate where critical decisions have been made, for example by regulatory authorities or buyers, and that will impact on the strategy of the organisation. Not only should the parameter be measured, the organisation should also strategically interpret the information coming in for its impact on said organisation and amend strategy and tactics accordingly. This important element of the process allows the organisation to recognise when strategy requires small adjustments and when significant change is required. It helps the organisation avoid repeating costly and time-consuming scenarios and simulation planning too often by stretching the value of the strategy and assumptions over time. When an organisation wants to consider how a landscape or market may evolve in the future and how they may respond to the changes identified, especially in the fast moving markets of today, a thorough and detailed approach is required to provide an accurate and helpful assessment. This often goes beyond traditional market planning approaches. The goals of the project should be clearly defined and resources and time should be carefully considered and allocated prior to embarking on the project. Furthermore, scenarios and simulation should be considered merely as a means to achieving a well constructed view of the likely future and a well constructed strategy and set of tactics that position the business for success. External partners should be broadly skilled in strategy, perhaps with specialism in scenario and simulation, not merely functional experts in some aspects of the process.